Today we slipped out on the Trade In with light line and angler Maureen Klause searching for another possible blue or mako shark record. The fog was super thick and the swell was in our face so we stopped well short of where we wanted to be. We tried out the Misty Blue for a bit in clean 57 degree water and had one small blue shark roam through our slick. We moved out to the Cigar and found the same conditions so continued out to the 750 square area and got into 59 degree water. We only managed to find a blue shark there as well. Not what we had hoped for but the boat ran great and is ready to go now! We made it back to NJ with Exile 65. What a great season we had in the Bahamas! Thanks to everyone who fished with us in Cat Island. We enjoyed every minute of it and certainly made a lot of memories. For now we are looking forward to getting into some action here in NJ and are ready and available to charter. Internet was pretty much down our last week in Cat Island so here is a quick wrap up of the tournament. Day 1 was pretty slow overall for us. We managed to go 1/1 on blue marlin which set us in 4th for day 1. Day 2 was the day of the dolphins. They were thick and we caught them nearly nonstop most of the day. 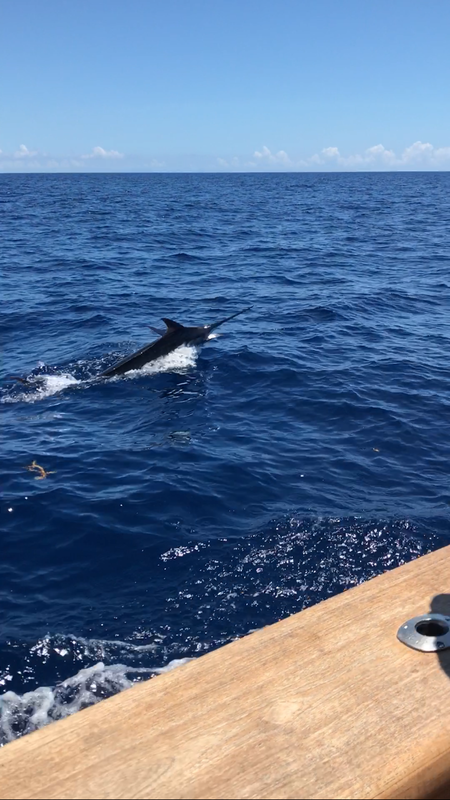 We also went 1/1 on white marlin. This still kept us in the hunt in 4th. Day 3 we made a run to Long Island to try and find some better action. 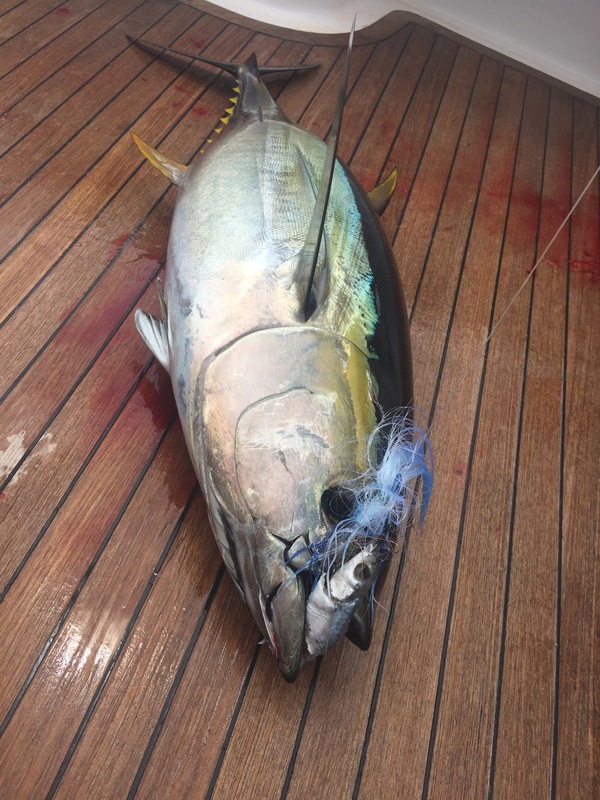 Unfortunately all we found were some dolphin and a 20# blackfin tuna. Tough tournament for us, but we had an awesome crew and had a lot of fun. Checked off a couple of first fish for some of the crew and had a great time. Off to NJ now, long trip ahead. 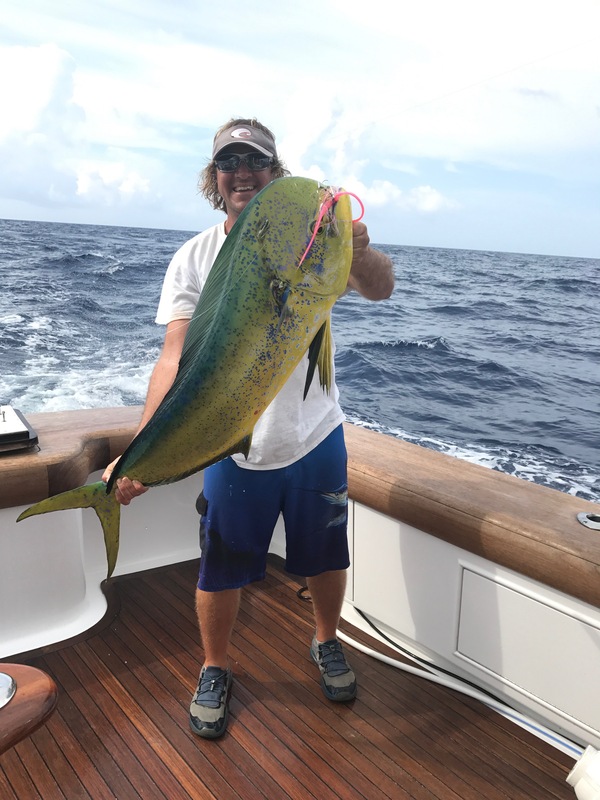 Today the winds went SW which typically isn’t the best here but we got right into action on mahi nonstop to the point where it was difficult to fish for anything else. 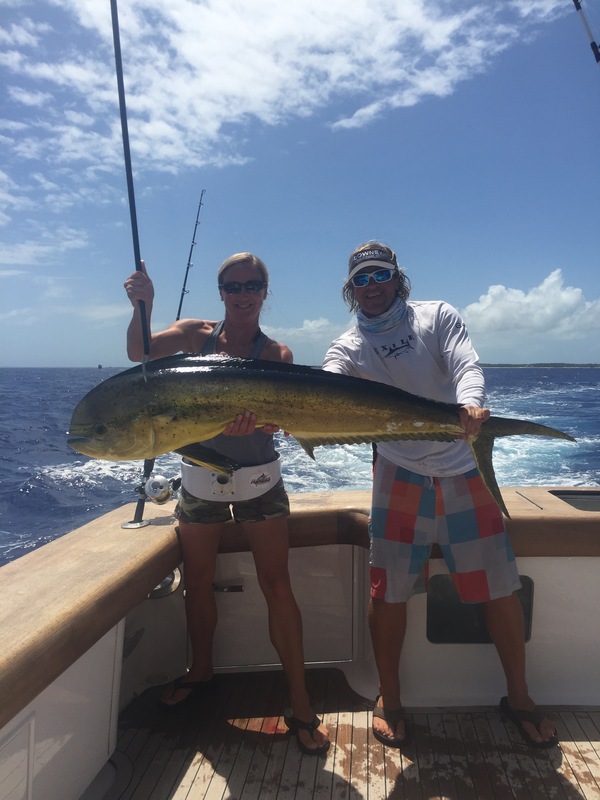 10-20 pound mahi were piling into our spread all morning and we even lucked out getting a wahoo hooked just right with a circle hook and got him in the boat. 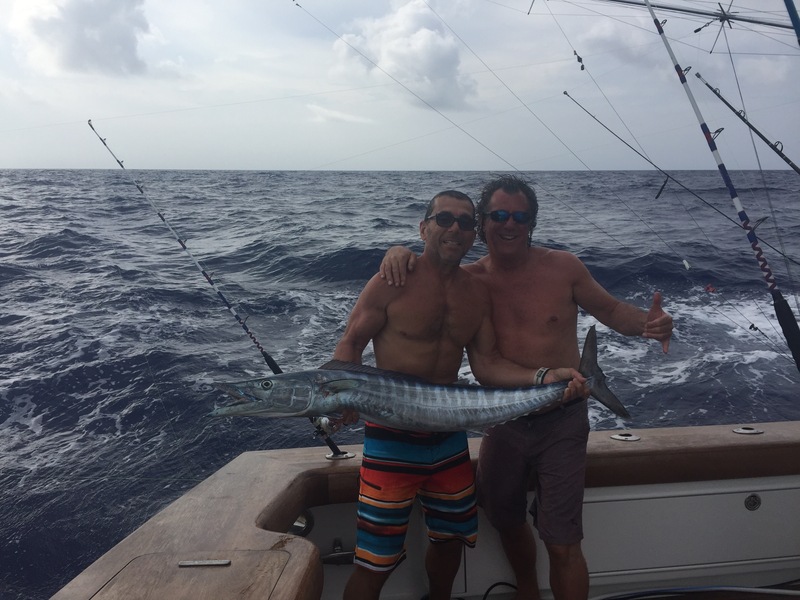 We were pretty stoked to have some wahoo to eat!!! The billfishing was very slow and we called it a half day. Great action again and another fun day! We started early today with light winds out of the SE at 8-12 knots all day. Today we didn’t get the red hot start at Devils Point like we have the past two days but we managed to find some mahi and two white marlin before 10am working along down the edge. We kept working at it and the mahi were thick today for sure. 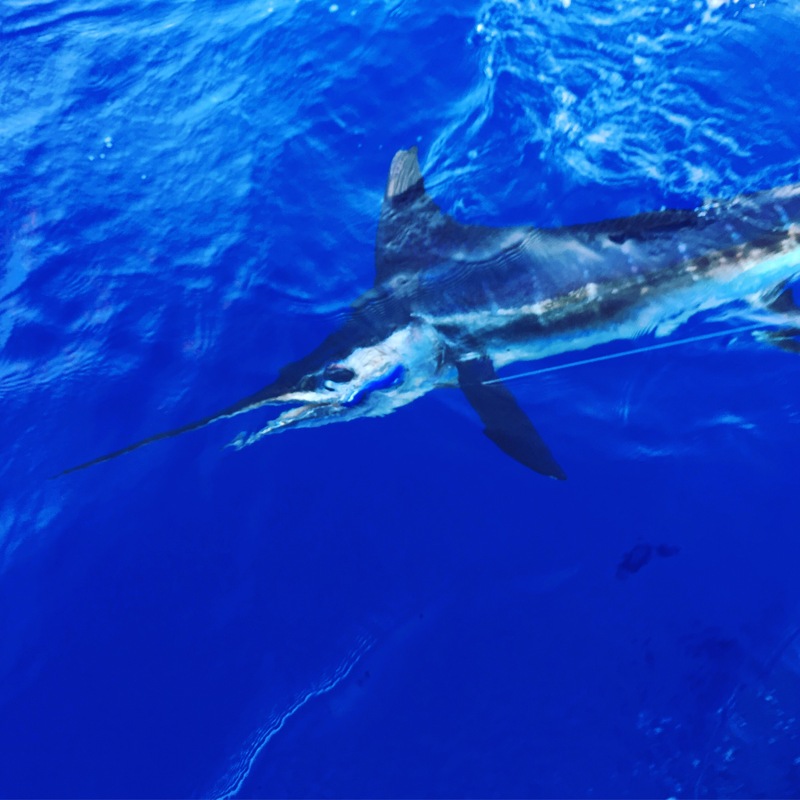 We picked up another white marlin mid day and kept weeding through the 12-30 pound dolphin that were tearing through our baits. Awesome action!!! 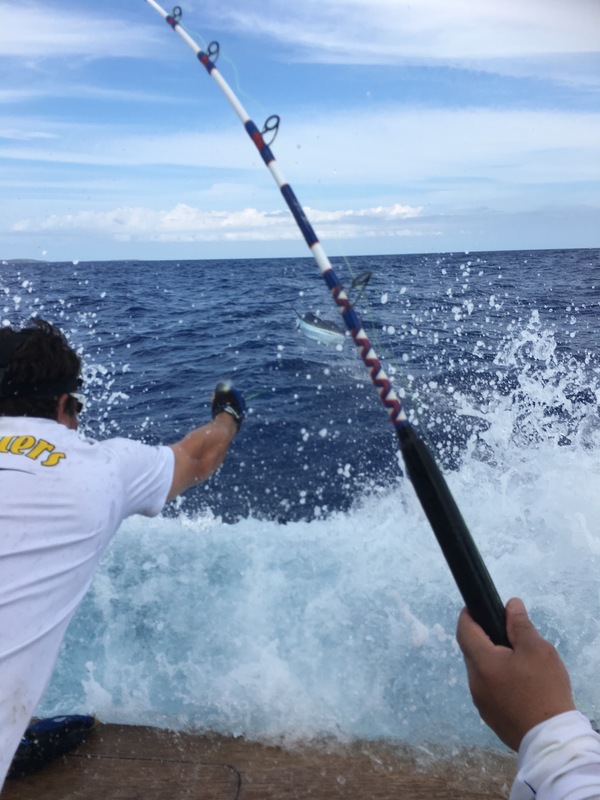 We were lucky enough to get hooked into a blue marlin off of the right teaser which and after 35 minutes Guy got a clean release on the fish for his first blue marlin! Congratulations Guy. Awesome teaser bites on all 4 marlin today, always makes it fun! Another beautiful day here in paradise and the billfishing was solid again today. We went 4/7 on white marlin today along with about a dozen mahi in the box and we spent a couple hours mid day bottom fishing and added some rock hinds to the box. Another awesome day on the water! Today we got to see near perfect weather on the Full Moon. Light winds, calm seas, sunny and warm! We started off the morning with a double header of white marlin off of the squid chain teasers. Great way to start the day! 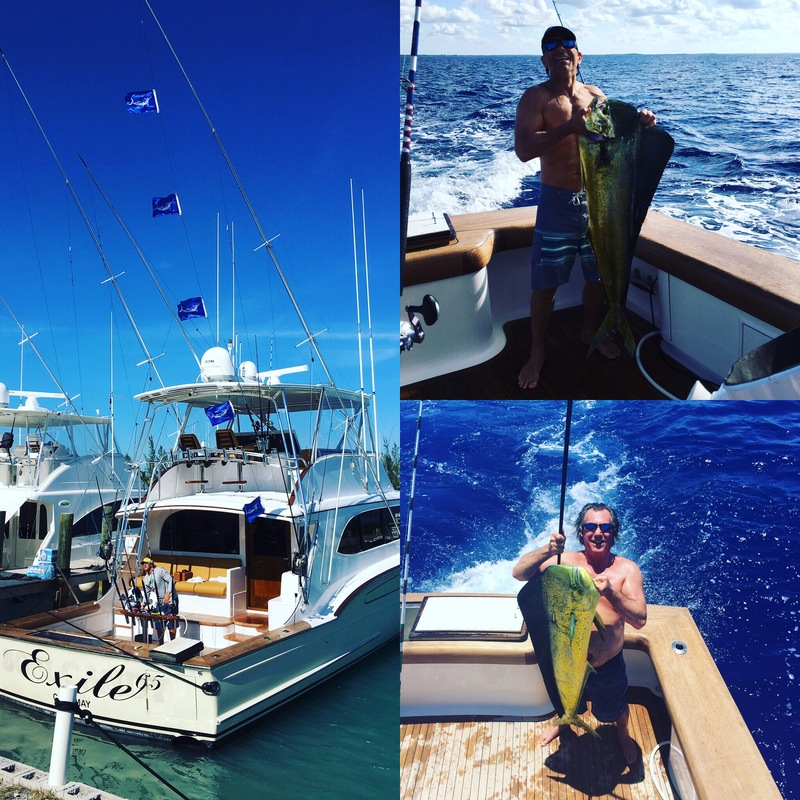 We pounded out the area and caught a bunch of mahi and released one more white before that dried up. We moved along and stumbled upon a few more mahi and then released another white marlin in the mix. We worked Columbus Point for a bit and did manage to release our 5th white marlin of the day here. 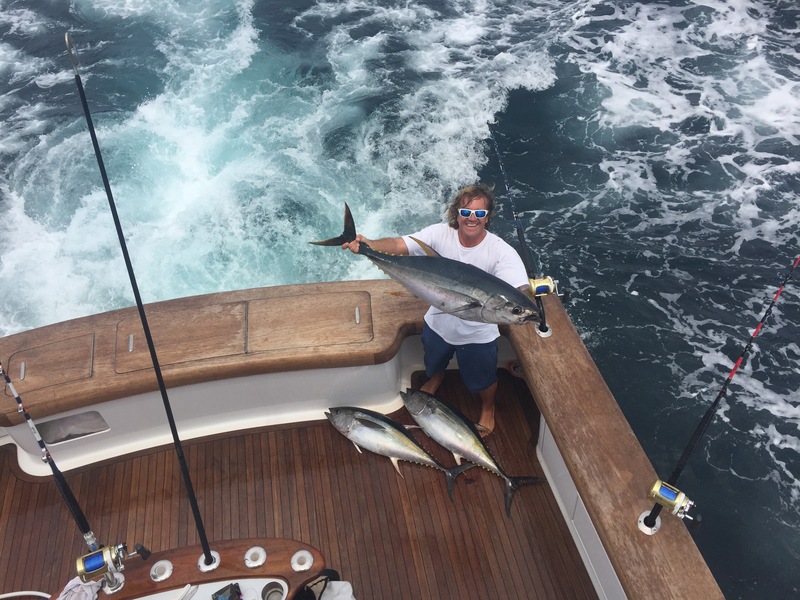 Action stayed at a slow pick and as we were working our way back we missed a Sailfish and a white marlin but all in all, awesome day of fishing on Exile 65!!! Box full of mahi to 34 pounds and 5 white marlin releases.